Claiming my blog for Bloglovin'! My first Halloween mani was a simple jelly sandwich with French tips. 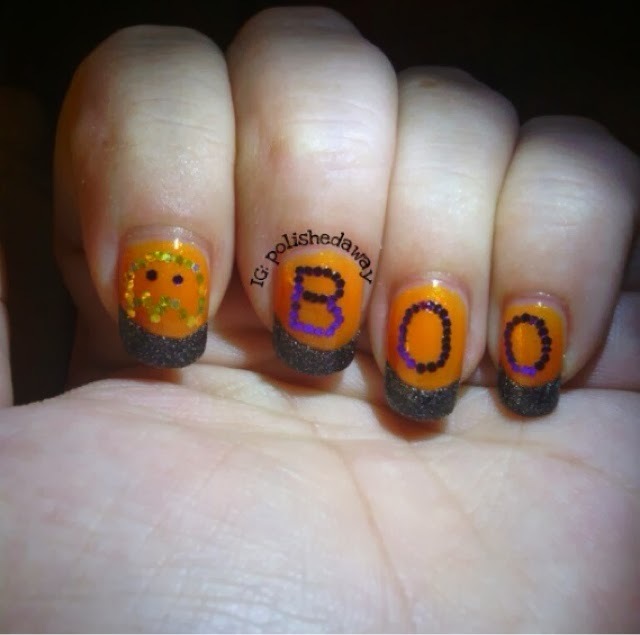 I then used some acrylic paint & a nail art brush to add some stitches to make it more Halloween-y. topcoat, HK Girl "Glisten & Glow"
I'm a HUGE fan of glitter placement, so it only seemed fitting that my next Halloween mani include this nail art technique! Polishes used: SinfulColors "Cloud 9" and Zoya Pixie Dust "Dahlia"
My poor ghost didn't come out quite like I saw him in my head, but I feel like my letters were spot-on! And, thank God, my nails are slowly getting back to this length. My next Halloween inspiration came from another YouTube tutorial. 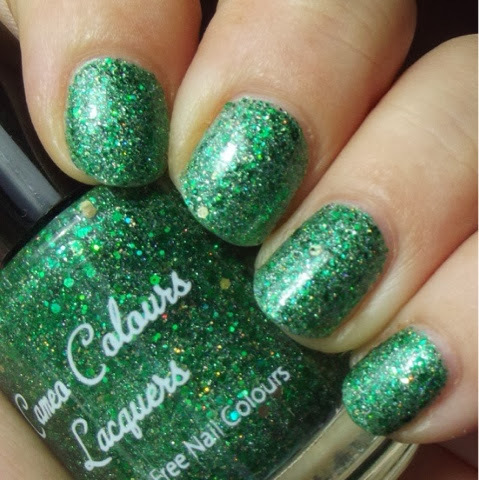 This time, from ArcadiaNailArt, (Seriously, how do I embed a link?!) called "Witch's Brew". Polishes used: SinfulColors "Secret Admirer" and "Innocent"
"Grafitti Glitter" Topped with HK Girl "Glisten & Glow"
She wanted a brighter green than what I used in mine, that's why I went with "I'm With The Lifeguard". 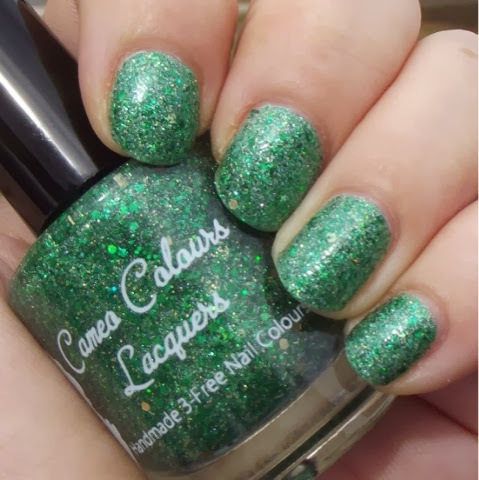 When I did mine, I mixed two glitters together (trying to achieve a similar look to what ArcadiaNailArt used in hers) and completely forgot that I had this glitter. I definitely like this glitter better. 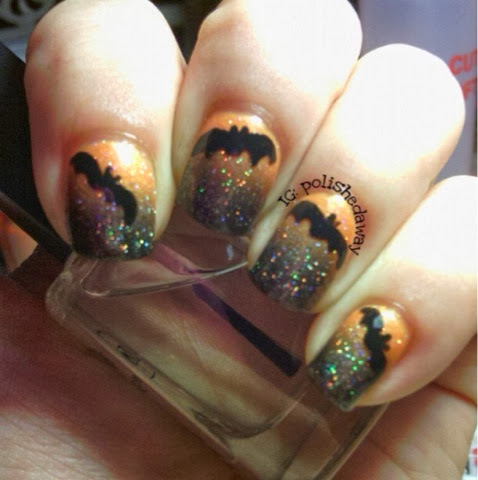 After I won the Instagram contest with my gradient & bats, she decided she wanted those too, so I did that on her thumbs as accents. It was so cute hearing her giggle like a school girl when I did the gradient, lol. "It's like magic!" she said, lol. 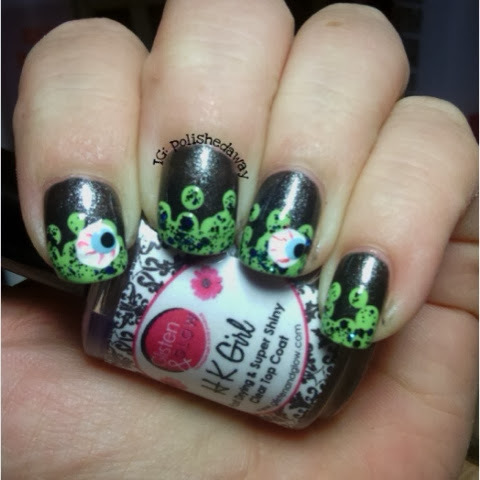 I also used acrylic paints to do these creepy eyeballs, but I used a red nail art pen from a set that Mom bought for me at Sam's Club, so the red veins didn't come out as well as they did in my own "Witch's Brew" manicure. Maybelline Polka Dots "Clearly Spotted"
Again, I used acrylic paints for the black & white. 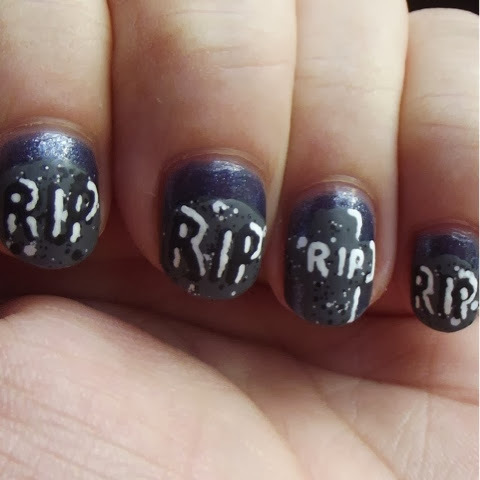 This was my least favorite out of all the Halloween manicures that I did, but being that it was my first time trying this, I guess it came out okay. 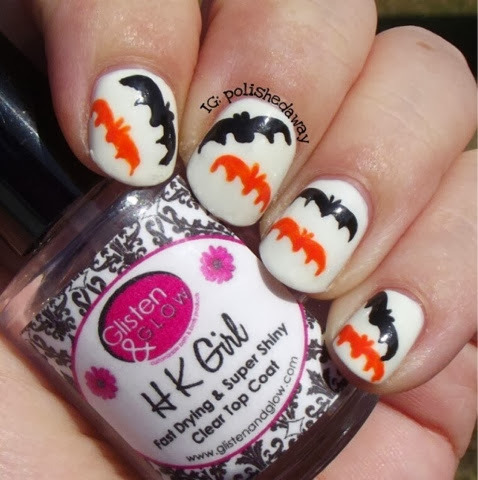 Finally, for my last Halloween nail art, I did the free-handed bats again, but this time I used a new detail brush that my best friend got for me instead of a toothpick. 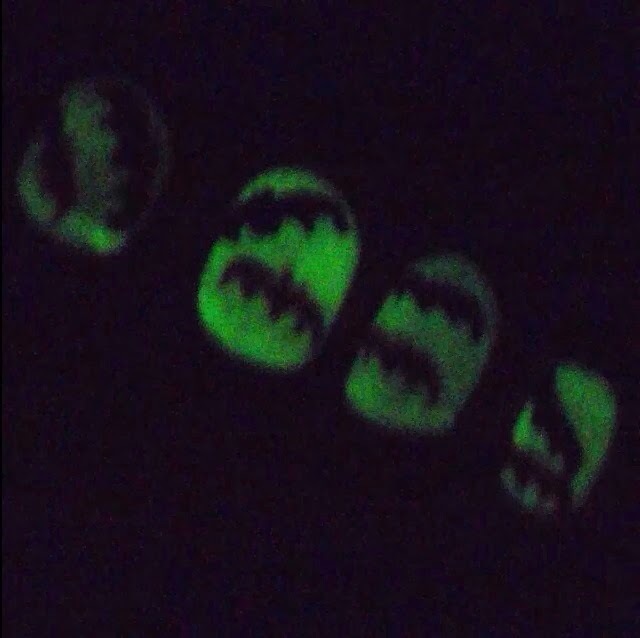 I used acrylic paints to add them over a white base with a glow in the dark polish. topped with HK Girl "Glisten & Glow"
My camera freaks out with glow in the dark polishes, lol! So, there you have it! 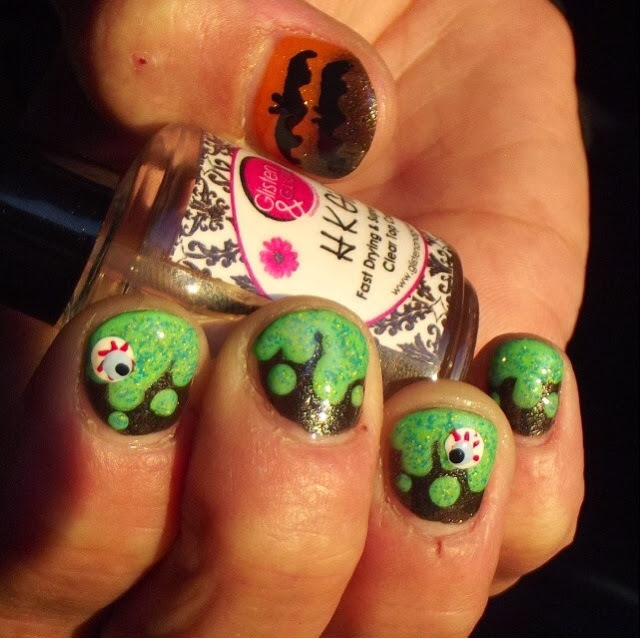 All of my Halloween nail art for this season! Which one is your favorite? 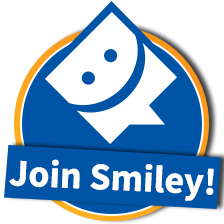 Thanks for reading, and happy polishing! No, I do not work outside of our home, but I do work inside and FOR our home. My job is stressful, exhausting, and more often than not, thankless. But, I chose this life, so I do it without question and completely out of love. I don't ask for much. But I was going to have this collection. Oh yes. I pointed out the fact that next month, he will be spending around $60, just on himself, for a video game. I explained that if he let me preorder the set, it would save him money. I really didn't think he would bite, but to my surprise, he pulled out his wallet and handed me the card. I swear, I heard angels singing. Three days later, my package came. I couldn't wait to get inside & tear it open, just knowing that they would be even more beautiful in person. And, Lord, were they ever! I am a HUGE fan of textured polishes, and I have quite a few from various brands. But, the Julie G Frosted Gumdrop collections are my absolute FAVORITE! Now, I really like the Zoya Pixie Dusts, but they're harder for me to get. Like I said, I don't normally have the freedom of buying online. And, I recently found out that an Ulta opened up near me, but haven't had the pleasure of going yet. So, Julie G, being exclusive to Rite Aid, is much easier for me to get. Heck, there's a Rite Aid just a few blocks away from me, lol. And the fact that these polishes are affordable AND easily accessible, gets them brownie points with me. I love how, even though it's a textured polish, it has so much glitter in it that it literally twinkles. So, I went a little bipolar, & started adding a top coat to a few of them. I was anxious to see how much more it would twinkle, because, you know, hehe, I do love me some glittah!! Hope you all enjoyed this post! Feel free to let me know what you guys think, what I could improve on, what I'm doing right OR wrong, etc! It's going to take me some time, but I'd really love for this blog to eventually be a success. Constructive criticism is always welcome, as long as you're nice about it! Don't forget to find me on Facebook and Instagram! Search both for 'Polishedaway' <3 See y'all soon! So, I decided to jump on the bandwagon & start a blog! I'm interested to see if anyone will actually read it, so we shall see! Bear with me, y'all...I have no clue what I'm doing, but I will give it my best! If you follow me on Instagram, you'll know that I am a huge supporter of Cameo Colours Lacquers. What started out as a polish swap, has turned into so much more, as I now consider Cameo a dear friend. I am now the proud owner of 21 of her gorgeous polishes, & am constantly amazed at the stunning beauty & awesome quality of her stuff. Recently, I went through major surgery, & was having a rough time, as my husband is NOT very supportive of me or my recovery. 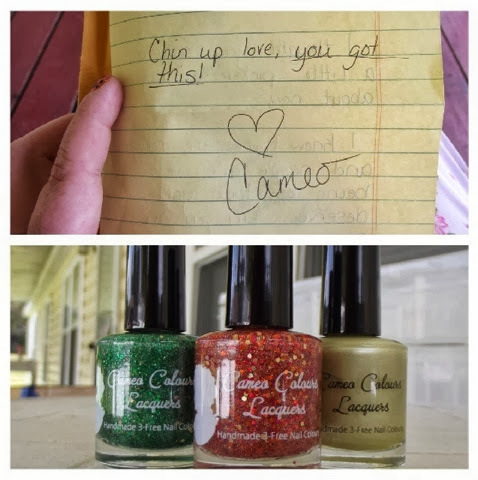 So, in an effort to lift my spirits, my sweet friend sent me some surprise nail mail, which instantly brought a smile to my face, even before even opening the package. I opened the package & got a giggle when all this loose glitter fell out on me everywhere! Then, I read the note, & was so touched, that it brought tears to my eyes. Words of encouragement were just what I needed at that moment. Then, I saw my new pretties! As if getting a surprise from her wasn't enough, she sent me Mistletoe Make-Out Session, which has not been released yet, making me the very first owner! (Be jealous, lol!) This will be a part of her upcoming holiday collection, scheduled to be released next month. I took a few different shots because I don't have a light box, & the sun only peeked out for about 5 minutes total. It had gone back behind the clouds for this shot. Next, we have Indian Summer, which is from her Beauti-Fall Collection. This one is near & dear to my heart, as I had the privilege of helping name this one. Not only did it SCREAM Indian Summer to me, but Indian Summer was the name of an album/song that my dad used to play when I was a kid. After losing my dad to lung cancer in July of 2004, any memory is a fond memory. But thinking about that song takes me back to a time when life was simple and happy. 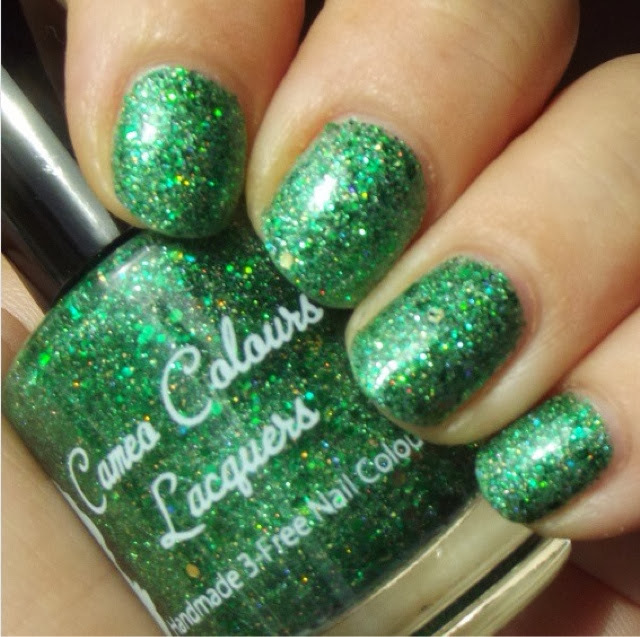 So, when I suggested the name & Cameo loved it, I was honored that she chose to name her beauti-fall polish that. *Nudge, nudge! See what I did there? Hee hee* Out of all 21 CCL's that I own, this one is my absolute favorite, for all of these reasons. Indian Summer, 3 thin coats with topcoat. 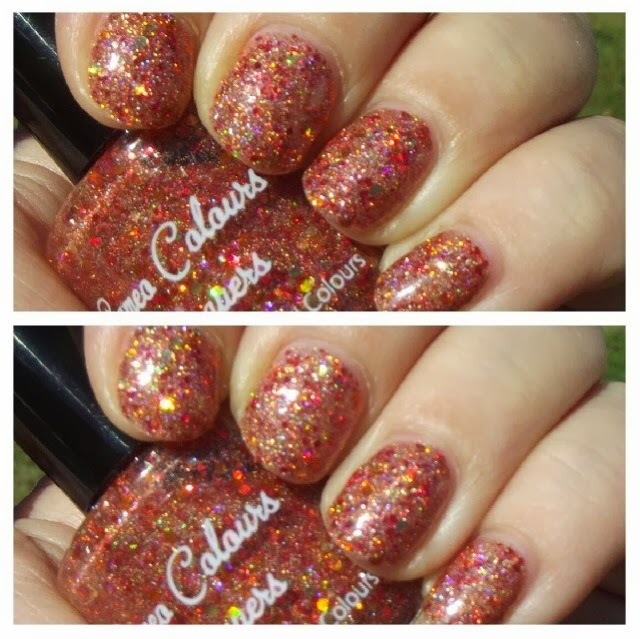 Bottom pic is slightly out of focus to show off more of the gorgeous sparkle! Finally, we have Brighid, from The Divine Collection. This is a beautiful pastel yellow linear holographic polish. Normally, I'm not one to choose to wear yellow polishes, as I don't think they go very well with my skin tone. But this one, well...what's not to love?! Just look at that holo! Monday, Cameo released The L Collection, a collection of 4 beautiful duochromes, which you can also choose to add linear holographic glitter to! See www.cameocolourslacquers.com for details! Here's a code to go order! Help her afford to get her pup to the vet! Well, there it is: my first blog post! I hope that a lot of you will follow & read what this boring 'ol, SAHM has to say about her obsession! Enjoy!